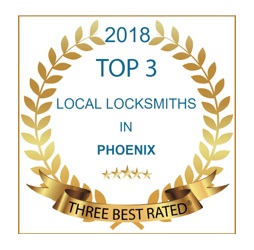 Scottsdale’s Saguaro Lock & Safe (also known as Scottsdale Lock & Key) has merged with ACME Locksmith and brings over 30 years of dedicated Scottsdale Arizona locksmith service to Scottsdale & Paradise Valley. Saguaro Founder Roland and his sons, Scott and Sean, have been operating their Scottsdale, AZ Locksmith Shop since 1971. We couldn’t be more excited to welcome them to the ACME team! Need a Locksmith in Scottsdale, AZ or Locksmith in Paradise Valley? Safes for sale, installation, repaired and moved. 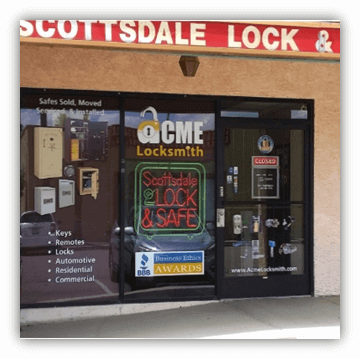 Stop by our Locksmith Shop in Scottsdale to view selection. Rekey door and business locks so that the locks work with a new key (no need to replace your door hardware! Great service. Fast to respond and Mike was super nice. Will use again and highly recommend. Erv from Acme came out and re keyed all my doors. Excellent customer service and reasonable prices. Definitely recommend them! Best locksmith ever !!! From the guy at the store to Big Mike with the delivery this was the best customer service I have ever experienced. Friendly knowledgeable staff, on a scale from 1 to 10 I would have to give the a 20 . Big Mike relocated our safe from one area to another in our home. He was very professional and very personable. Job was completed without any issue. He also installed the Safe originally so we had no hesitation in utilizing his services again! Bobby came out to service the door/lock at our office and he is wonderful. He is knowledgeable, competent, professional and friendly, easy to talk to. Great great Great experience. We’ll definitely use AcmeLocksmith again and will request Bobby. Erv did an excellent job in repairing the locks at our house and his charge for the work was very fair. I was very pleased with the service call. Big Mike was able to fix the lock more cheaply than replacing it ! Kept me informed of what he was seeing throughout his time here. A real money saver for me ! Thank you! Great locksmith. They replace the pins in my classic car locks. They work flawlessly and the price was affordable. I highly recommend ACME Locksmith! I am a Property Manager and I always use Acme when we need a locksmith. They are professional and their customer service is excellent! Big Mike helped us out today and he was wonderful! I highly recommend Acme for all your locksmith needs! Big Mike was wonderful! Honest ... Honest ... Honest. I would highly recommend his services. Ryan just left after rekeying the home, very professional, knowledgeable and got the job done much faster than expected. Top notch service, you’re in good hands with this guy. Robert did an amazing job and explained everything he did. Super service and very efficient. Thank you. Great experience. Gentleman named Bobby was prompt, knowledgeable, polite, and opened my Jeep quickly. Was able to supply the battery needed for my fob too. The battery was low so it did not sense when I left the key in the car so it defaulted to lock. Thank you! 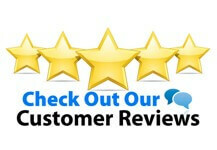 Erv showed up on time and performed the job professionally, quickly, and reasonably priced. Would definitely call him again. Best customer service! Erv from Acme was able to correct DIY lock projects with helpful suggestions on how to make everything work securely and efficiently! Thank you Erv and Acme! From the moment we went to the store all our questions had been answered. Everyone was great! We appreciate the fast service and Big mike and little mike where great to work with as well! Thank you! I had an emergency and needed into my old unreliable safe pronto. They got me in and delivered a new safe all in one trip! !Great Customer Service!! Eric was awesome, honest, and fast. Holy cow. Come here for your lock needs!! 5 stars all around. Mike came to deliver and install our safe. We could not have been happier with Mike and Eric who helped us in the shop make our selection.We have had a great experience with Acme Locksmith....professional all the way around!! Just great!! 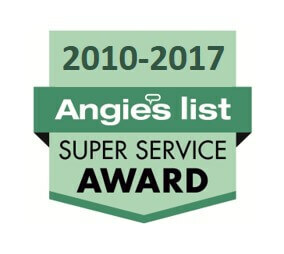 Thank you for taking such great care of us throughout the entire transaction!Great service and excellent explanations!Looking forward to the installation of our purchase. I needed a new key for my Honda van, and found this little gem of a store -- Acme Locksmith. Although they didn't have the exact key in stock, Eric L. ordered one for me, and once it was delivered to the store, he made a perfect replica from the original. 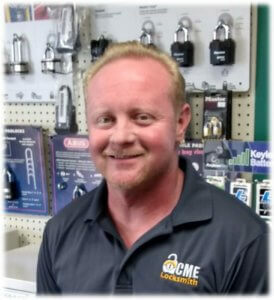 Eric is a very skilled locksmith with excellent customer service skills! I will return to Acme Locksmith for my all of my key and security needs. Kudos for a job well done! I highly recommend the Scottsdale location, Eric was very professional and didn't give up until he had my broken lock taken care of on my Mobile Health Clinic. It was blistering hot that day and that didn't stop him from giving me the best customer service. Great communication, Eric was easy to talk to, understood where my problem was, and had a guy out quickly and efficiently. Would use again, recommended to my family already if they ever need a locksmith. Big Mike and David were friendly and awesome. They came to move a large safe for my previous tenant and, at my request, fixed my bedroom lock on the spot. They were friendly and took the time to show me how to work the bedroom keypad lock. Highly recommend them! As always, great. Big Mike came by on time and did the job right! I love that I can trust this company with my security needs!! Mike arrived on time, and was a very pleasant fellow to meet and to work with. When he finished putting the new equipment on my safe, He thoroughly explain to me how to properly use the safe door. He was very patient throughout the whole process. Nice guy. ACME Locksmith was great! They were on time, very professional, and explained every thing they would be doing (and every charge) before they started their work. I will call these guys again! Purchased safe from Acme. Completely seamless and pleasant experience from start to finish. Delivery, installation, and on-site tutorial were all very professionally accomplished by a skilled and knowledgeable crew. I highly recommend this business for your security needs.